Scuba Diving Paradise. The Island of Cozumel on the Yucatan Peninsula has more than 40 dive sites and numerous nature preserves. Cozumel is a scuba diving paradise where heaven can be found under the sea, that is why professionals and amateurs alike come to discover this impressive water ecosystem made up of reefs, marine fauna, and multicolored beauty. Besides diving and snorkeling, there are many other activities such as tours through the jungle, botanical gardens, dolphin swim programs and visits to turtle sanctuaries. Cozumel has peculiar environmental characteristics with brackish lagoons and endemic species such as the dwarf raccoon, the inhabitants of the island have joined efforts with various authorities to ensure the protection of fauna and flora. Some tips to enjoy a great stay and make the most of your travel time on the island starts at home by booking in advance all the tours and activities you want to try. There are many beach clubs to enjoy the sun and the Caribbean breeze, many spaces as San Gervasio offer visitors tranquility and history. An example of this is the Ecotouristic Park Punta Sur, where you can enjoy more than 1’000 hectares of beautiful natural landscape, with mangroves, coastal dunes, museums, archeology and areas of wildlife observation. The Colombia lagoon offers a different route, on a boat for about 30 people, where you can spot local bird species and admire sea turtles on their protected reserve. To the south of Chankanaab, on the road, you will reach the Punta Sur beach, where you can rock calmly in a hammock area while contemplating the various shades of blue Caribbean Sea. A few meters away, you’ll find the pier of the Colombia lagoon, reforested and preserved by the Cozumel people, mostly children. Remember to respect nature in your visit, and help keep the beaches free of litter. Nearby are the Ixtacún and Chunchakaab lagoons that along with Colombia, set up the lagoon complex. At the end the day you can enjoy a cool drink by the sea near the Mirador de Cozumel, in a large palapa called Welcome to Miami. 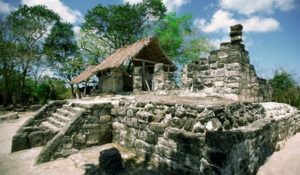 Enrich your experience visiting the impressive archaeological sites of the island and tasting the local cuisine, which is a mix of the Yucatan cuisine including local seafood. A feast of flavors and experiences that you cannot miss! Think about a jeep tour so you can freely explore the Island. If you want to check out for more information on this island and its endless options of fun, contact us. Explore it for a day and you will want to come back for more!